Most people are more familiar with deer than elk. Deer are the hoofed ruminant mammals forming the family Cervidae. There are two main groups– the Cervinae (which includes the fallow deer as well as elk) and the Capreolinae (which includes reindeer and the moose). So elk are a form of deer. Indeed, elk are one of the largest species within the deer family as well as one of the largest land mammals in North America. Interestingly, elk were long believed to belong to a subspecies of the European red deer, but scientific evidence from studies starting in 1998 show that idea to be false– they are, in fact, two distinct species. Deer seem to be ubiquitous but elk aren’t found everywhere. For most elk hunts, you’d expect to be in the Rocky Mountains, among high and challenging mountain terrain. Here’s a key thing to know: deer are browsers and elk are grazers. Therefore, look for deer in forests and/or “edge habitats,” while you’re most likely to spot elk in open meadows/woodlands. Deer tend to range over a square mile or two, while elk can cover much larger territory– like 500 square miles or more. So you might have to travel more just to catch up with an elk herd. Did you know that some elk herds can number in the hundreds? You don’t normally see that many deer traveling together, but elk certainly do. If you’re looking for tracks, elk tracks are larger and more rounded than the pointy tracks left by deer. Elk poop pellets are twice the size of deer ones. Did you know that elk tend to rely more on their nose than their ears? You’ll want to wear scent-masking gear when hunting elk. Finally, know this: a deer might get you 30 – 60 pounds of boneless meat, while an elk can bring in 100 – 300 pounds! 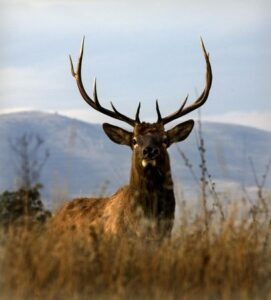 Samuelson Outfitters of Fraser, Colorado, offers both deer and elk hunts starting in Granby, Colorado. From a full service wilderness camp to limited service drop camp and then some, Samuelson Outfitters can help you find the deer or elk you’re looking for; please email elk@samulesonoutfitters.com for more info.